Pulling the rug out from debates about interpretation, The Language of Statutes joins together learning from law, linguistics, and cognitive science to illuminate the fundamental issues and problems in this highly contested area. Here, Lawrence M. Solan argues that statutory interpretation is alive, well, and not in need of the major overhaul that many have suggested. Rather, he suggests, the majority of people understand their rights and obligations most of the time, with difficult cases occurring in circumstances that we can predict from understanding when our minds do not work in a lawlike way. Solan explains that these cases arise because of the gap between our inability to write crisp yet flexible laws on one hand and the ways in which our cognitive and linguistic faculties are structured on the other. Making our lives easier and more efficient, we’re predisposed to absorb new situations into categories we have previously formed—but in the legislative and judicial realms this can present major difficulties. 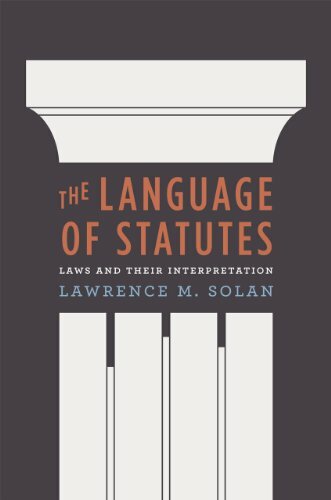 Solan provides an excellent introduction to statutory interpretation, rejecting the extreme arguments that judges have either too much or too little leeway, and explaining how and why a certain number of interpretive problems are simply inevitable.